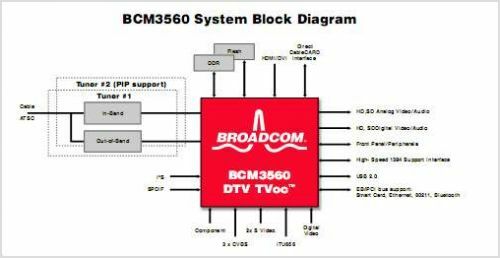 The BCM3560 combines a cable/terrestrial 4/1024 QAM and 8/16-VSB receiver, an out-of-band QPSK receiver, NTSC Demodulator DVI HDMI receiver, a transport processor, a digital Audio Processor a high-definition (HD) MPEG Video Decoder 2D graphics processing, digital processing of Analog Video and Audio Analog Video digitizer and DAC functions, stereo high-fidelity Audio DACs a 250-MHz MIPS processor, and a peripheral control unit providing a variety of Television control functions. The cable/terrestrial receiver directly samples a Tuner output with an A/D converter It digitally resamples and demodulates the signal with recovered Clock and Carrier Timing Filters and equalizes the data, and passes soft decisions to an ATSC A/53 and ITU-T J.83 Annex A/B/C compatible decoder. A CEA/EIA-909 smart Antenna Interface is included on chip. BCM3560 Pinout will be updated soon..., now you can download the pdf datasheet to check the pinouts ! This is one application circuit of BCM3560,If you need more circuits,please download BCM3560's pdf datasheet.